Do you love food? Do you love comics? Cooking Comics! 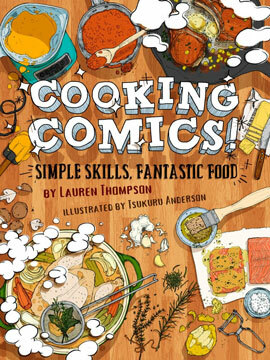 is a fully illustrated comic-book-style introduction to the skills you need to master the kitchen! Not only will you learn kitchen fundamentals, but you will also learn delicious and versatile recipes utilizing those techniques—complete with options to dress up your meals or quick shortcuts to simplify your mouth-watering creations. This is the most complete introduction to fundamental kitchen skills you need to go from novice to pro, all while having fun reading comics! Lauren Thompson has been an instructor in the culinary arts for years, and has worked in some of the best restaurants in the country, currently she is the chef-de-cuisine at the renown Café Juanita. She lives in Seattle, Wa.